Americans aren't getting enough sleep, and it's becoming a huge concern. The National Institute of Health suggests that school-age children need at least 10 hours of sleep, whereas teens need 9-10 hours, and adults need 7-8 hours, which we aren’t getting. Meanwhile, the United States Centers for Disease Control and Prevention has declared our "sleep recession" a national epidemic. Most of this data comes from a Behavior Risk Factor Surveillance System (BRFSS) survey in 2009. They found that nearly 34% percent of adults sleep less than 7 hours of sleep during a 24-hour period. Of those 48% reported snoring, 37.9% said they unintentionally fell asleep during the day, while another 4.7% admitted to nodding off or falling asleep while driving. This was after canvassing sleep behaviors in 12 states among 74,571 adults across sociodemographic factors and geographic factors. 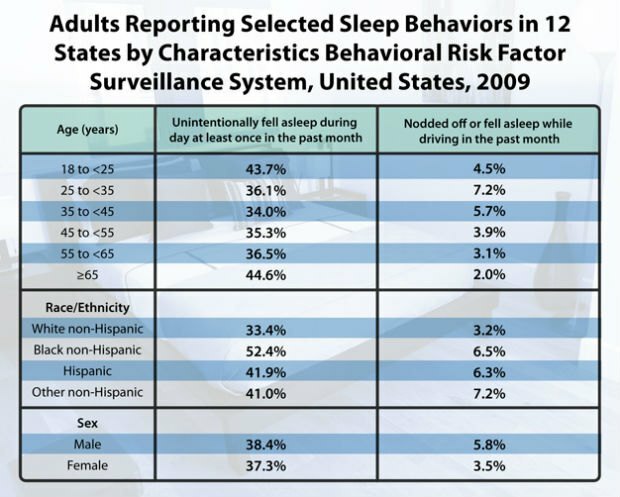 Adults Reporting Selected Sleep Behaviors, via the CDC. Possible sources for this pandemic include societal factors like grueling work hours and the constant bombardment and access to technology (smartphones, televisions, computers, etc.) along with sleep disorders such as insomnia and sleep apnea. The CDC hasn't really announced any plans on correcting this nation-wide problem, but it does suggest that you take steps in order to good sleep hygiene, the promotion of good sleep habits and regular sleep. Those steps include going to bed each night and waking up in the morning at the same time, avoiding large meals, caffeine and nicotine before bedtime, and the avoidance of nicotine in general.